Warmlite Triple Glazed windows use three panes of glass which form two insulating layers that provide the ultimate thermal and acoustic insulation. Almost indistinguishable from their double glazed counterparts, but superior in terms of performance by using two panes of Low E glass (the internal and middle panes), two warm edge spacer bars and two argon-filled cavities. Add to this the external pane of glass – which lets in more of the sun’s warmth – and the PVCu window frame, and you have a window that will make your home a warmer, quieter, cheaper and more environmentally friendly place to live. The industry-leading 6-chamber PVCu frame eliminates the need for thermal inserts and uses structural PVCu for rigidity rather than heat-conducting steel. Triple glazed windows will plug the deficit as it can retain heat unlike any other window type. It can also reflect heat into the home due to the internal pane of soft coat glass inserted into the PVCu frame. 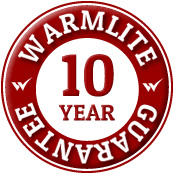 All Warmlite triple glazed windows and door installations are covered by our 10 year guarantee.